Wind power is an exciting emerging sector that needs those of us involved in fire safety to get onboard. Why? Because in Europe wind power is already the 2nd largest power generation method. A fun fact to give a bit of context is that 1 rotation of an Orsted 8MW turbine blade (takes 6 seconds) can power a regular home for 29 hours. This article takes a look at fire risk in wind turbines and how we can work as an industry to solve it. 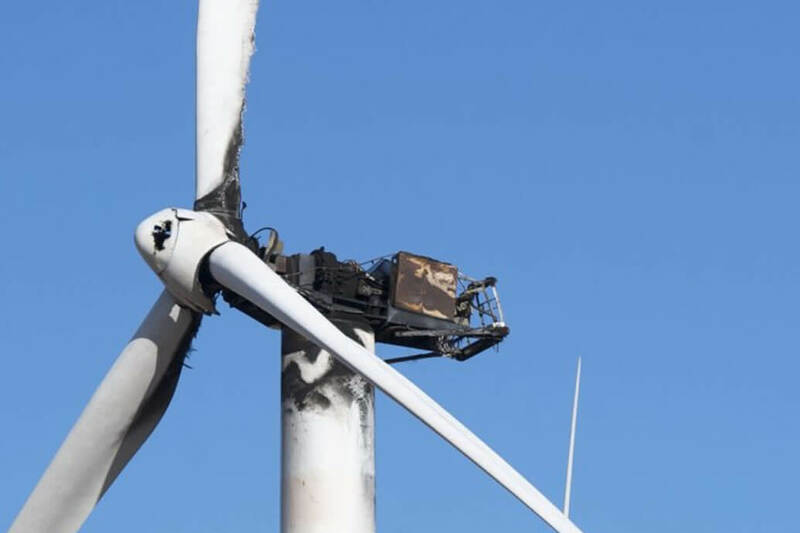 Turbine fires are expensive. They attract negative publicity. It is estimated that 0.3-0.5 fire incidents occur per 1000 power stations (onshore and offshore) every year. What it more, wind turbine fires tend to cause losses equal to or above the original cost of the wind power plant – especially offshore! With some turbines at almost 200m in height, they are effectively outside the range of the fire emergency services; and when it comes to turbines at sea, human intervention in the event of fire is virtually impossible. It is for this reason that the NFPA 850 Recommended Practices suggest guidelines and AHJs and other fire inspectorates, consultants, associations, the insurance companies and the OEMs themselves all have a role in play in developing good codes of conduct. Wind turbines require an active fire protection system, which includes but is not limited to detection (of flames, heat, gas, and smoke), alerting personnel and rescue services, and activating systems for fire suppression or extinguishing. Due to the height and location of wind turbines, classic firefighting methods come up against their limits and therefore fire extinguishing systems that use gases such as carbon dioxide, inert gases or clean agents such as FM-200® and Novec™1230, which are especially appropriate for dealing with fires in electrical systems because they extinguish the fire quickly. Section 10.5.3.2.2. of the NFPA 850 states that the Maintenance and inspection of total flooding gaseous agent systems and interlocked equipment are critical. All systems at some time maybe called upon to operate in an emergency situation and may help in saving life and property. It is for this reason that knowledge must be had that the system can operate to its full potential. There is a clear trend toward including fire suppression in newer units, but with systems, comes the requirement of maintenance. The assumptions in the installation, commissioning and maintenance of gaseous extinguishing systems are that they are highly pressurised and thus risk leaking and discharging, hence why annual inspections are required. Large wind companies, such as E.ON, have now begun investing in both in-house and third party operations and maintenance, driven by safety and quality concerns. Inspection should include an evaluation that the extinguishing system continues to provide adequate protection for the risk. This is essential under ISO 14520 where gaseous extinguishing systems have to be designed in relation to the discharging agent hold-time (if the room cannot hold the agent because of leaks the agent will disperse and not extinguish the fire) and discharging agent peak pressure (if the pressure is too high for partition walls or suspended ceilings they will be blown apart or damaged and possibly destroying the room integrity). However, routine maintenance is liable to be overlooked or given insufficient attention by the owner of the system. Are Annual Check Sufficient in Risky Environments? Given that offshore wind parks require huge investments and are difficult to reach in the event of a fire, an emergency automatic fire extinguishing systems is a must for insurance cover. But what if the suppression systems that are installed in the turbines to protect life and infrastructure do not release on actuation? Gaseous extinguishing/suppression systems are installed to protect against special hazards in critical infrastructure as their key objective. They deliver the infrastructural resilience that wind turbines require. If it is a known fact that there is a long response time to wind turbine fires, then it is unacceptable that the dynamic suppression systems are left unattended 364 days a year. There is a call for remote fire alarms in the turbines due to the lack of easy fire servicing stations, so why not also for the gaseous systems? Why have an alarm system to alert fire services of the fire if the protection system cannot secure the nacelle? A dynamic system needs monitoring. The reality is that gaseous systems are checked for contents annually because they are pressurised and anything that is dynamic offers risk of loss of contents, but this fails to deal with the probability of discharge or leakage for the 364 days per annum in the interim between certification checks. Gaseous extinguishing/suppression systems are installed to protect special hazards in critical infrastructure as their key objective. If the hazard is special and the infrastructure critical then this is the case for the constant monitoring of the suppression systems that aim to deliver the protection of them. Coupled to this is a complete lack Room Integrity testing after the gaseous system has been installed. As buildings age or their internal use is changed leak sites develop. If the gas cannot be “held” in the room on discharge during a fire event the probability of its suppression diminishes in direct proportion to the size of the leak sites. Room integrity tests are imperative for the determination of both the Hold-Time and the Peak Pressure needed for successful fire suppression. The level of leakage is carefully monitored in order to ensure the correct agent concentration is achieved; room integrity must be ‘tight’ enough to ensure sufficient retention time according to NFPA or ISO, yet remain ‘loose’ enough to prevent enclosure damage at discharge. The presence of undesired and unregulated leak sites reduces room integrity and will hence dramatically impact the Hold Time and Peak Pressure, placing room contents and potentially wall structures at risk. It is accepted that in wind turbines vibration can loosen connections while dirt, dust, and temperature extremes are known to cause unwarranted discharge. Additionally, openings in the turbine housing significantly inhibit achieving the designated agent concentration. Devising a solution to overcome these challenges can add significantly to the weight in the turbine. Focused on continued advancement of safety technology, Coltraco have now developed the Permalevel® Multiplex, a fixed fire suppression monitoring system, designed for continuous contents verification. Permalevel® is designed to ensure that fire suppression systems are always fully operational and that no accidental discharge has occurred, which could affect the effectiveness of the overall fire protection system in the event of a fire. With guaranteed systems operations, adaptability for purpose, 24/7 remote access to the systems status, an interruptible power supply and remote real-time monitoring, the Permalevel® offers the efficiency that is needed in a wind turbine. For regular inspection, the Portalevel® MAX is a handheld ultrasonic liquid level indicator, which can service a cylinder in 30 seconds (in contrast to 15minutes by traditional manual weighing) with accuracy of up to 1.5mm off the true liquid level. Portalevel® MAX builds on Coltraco Ultrasonics’ 30 years’ experience in designing, manufacturing and supporting ultrasonic liquid level indicating equipment, in 108 Countries and numerous market sectors and environments. The development program was born out of the desire to further improve on Coltraco’s existing 8 designs and taking on board feedback and opinions of our customers.